This hasn’t stopped them from trying, and the more the promotional engine for “I Really Like You” ramps up the more frustrated I’ve become. It started on the night of the single’s release, when Justin Bieber was once again positioned as a key figure in Jepsen’s career. As I wrote back in 2012, Bieber’s claims to Jepsen as his own discovery are fraught with complicated politics of age and gender, along with the simple reality that he is claiming ownership over a pre-existing Canadian artist with a record deal and a hit single in her home country. While Bieber can successfully take some credit for helping popularize Jepsen into the American market, that credit is owed more to Braun, whose marketing efforts helped generate the lipdub and subsequent tweeting that helped the initial rise up the charts. However, those marketing efforts have become my biggest problem with “I Really Like You,” as Bieber’s continued presence is increasingly at odds with Jepsen’s identity as an artist. Outside of an ill-advised duet on Kiss, Carly has been functioning entirely independent of Justin since her initial album cycle, starring on Broadway and working on an album that in no way makes an effort to connect to her relationship with the young singer. And so for Bieber to once again return to “my artist” rhetoric after two years of having nothing to do with her musical evolution is incredibly disingenuous, but also likely reveals that Braun sees that connection as crucial to the success of “I Really Like You.” Because Bieber was crucial to “Call Me Maybe,” he’s being considered crucial to “I Really Like You” living up to it, right down to Bieber appearing in the song’s just-released music video. And yet the video exemplifies every reason why this relationship no longer makes any logical sense. Bieber appears hiding in the final crowd sequence, gradually making his way to the front of the group and mugging for the camera. The media narrative was that Bieber just happened to be in New York and invited himself down to the video shoot, and that’s honestly what it looks like: if I didn’t know who Bieber was, I would swear that some kid snuck onto set uninvited and ruined the shot, and they ran out of money to do another take and were forced to leave this one in. Of course, I do know who Bieber is, and I know that Bieber didn’t just invite himself down to set: rather, he’s there because even if it’s no longer logical for Carly Rae Jepsen to be tied to Justin Bieber as an artist, it makes perfect sense to Scooter Braun’s Schoolboy Records stable as a business. Jepsen amassed 10.7 million Twitter followers in the wake of “Call Me Maybe,” but Bieber has nearly 60 million, and represents Braun’s biggest marketing muscle. 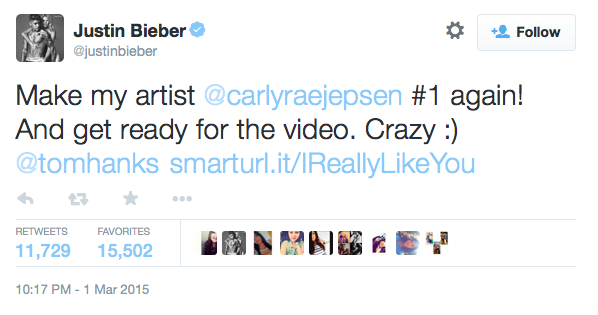 Bieber’s claims to ownership over Carly Rae theoretically increases the likelihood of those fans doing as he requests and buying her single, as they did with “Call Me Maybe.” His appearance in the video makes it that much more likely that Bieber’s fans will watch, share, and watch the video again. Here’s the problem, though: as an artist, making the kind of music she’s making, Carly Rae Jepsen should have nothing to do with Justin Bieber. In this TIME profile, where Jepsen discusses the development of her new album, we see an artist who is capable of standing on her own—Bieber is mentioned only to contextualize Braun’s professional success. This is how it should be: Carly Rae Jepsen is not defined by the circumstances by which “Call Me Maybe” became a success, and much of the coverage of “I Really Like You” has taken this principle at face value. However, the official promotion—the tweets, the video, etc.—have unfolded in such a way as to imply that Braun and Schoolboy Records still believe that Carly Rae Jepsen needs Justin Bieber to succeed, a notion that seems increasingly at odds with the music she’s making and the path she’s on as an artist. Tom Hanks is terrible at lipsynching, and the weird half-lipsynching that he does during most of the video’s action is distracting. The video’s adoption of trendy social media—Tinder—and Emojis is going to date it immediately, a blatant appeal to a young demo that steers into the skid in terms of Jepsen’s music aging her down. How did they get a front-facing photo of Tom Hanks in that coat on that street on Tinder so quickly? Does realism mean nothing to these monsters? I get why Tom’s “I’m pregnant” is in Jepsen’s voice, given the video’s conceit, but what is that other voice, exactly? Seriously, I’d swear Justin Bieber crashed the shot if I didn’t know it was Justin Bieber. Why was he kneeling down? Was he trying to surprise someone? I don’t understand that blocking in the least. I know that it’s tough with a multi-layered vocal, but am I the only one who feels that Jepsen should be singing the riff as opposed to the chorus during the final sequence? I am? Oh, good, I’m the crazy one. Got it.